I am constantly drinking water throughout the day not just because I am thirsty but also because I get migraines if I am not hydrated enough. I usually bring a bottle of water everywhere I go especially now that’s its summer. There’s nothing better than a cool drink of water to quench your thirst on a hot, muggy day. In the past, I have taken bottled water with me, but dislike the waste and the bulkiness. My car quickly becomes littered with empty bottles of water which Â I know is not very environmentally friendly. Those plastic water bottles are also very bulky to take with me out shopping. They don’t fit in my purse. Trust me, I have tried to jam one in before. Going for walks holding a bottle is also very annoying too. Its necessary to bring water with me and I always wished for an easier way to transport it. I guess other people must have had the same issues as me because there is now a water bottle that is designed with these key points in mind! Vapur- the Anti-Bottle! 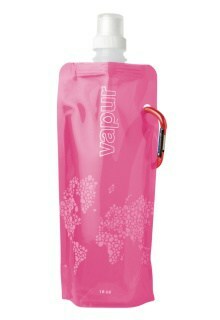 Vapur has created a reusable water bottle that is very different from any water bottle that I have ever seen before. Â For example, it’s flat when you first buy it and looks like a pouch! As you fill it up with water, it stands like a regular bottle! Then after you drink your water, you can roll it or fold it or leave it flat for easy storage. Because of these unique attributes, it is very portable. 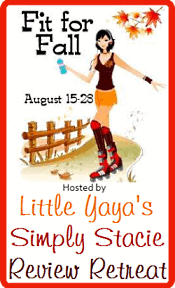 You can fit this bottle in your purse, diaper bag or backpack with room to spare. Vapur’s goal is to make bottled water obsolete and they have hit the jackpot with their Anti-Bottle. The Anti-Bottle comes with a carabiner so it can be attached to a backpack, stroller, bike, fanny pack,etc. I was thinking about using it when travelling to attach to the fanny pack around my waist and how convenient that would be. You can also freeze it and use it as an ice pack. A tip to keep your water cold is to fill it up half full and freeze overnight. The next day fill up the rest of the bottle and your water will be nice and cold all day long. Vapur bottles are made from BPA free polymer and is very durable to withstand daily use and cleaning. It can be washed in the dishwasher and then air dried to remove any remaining moisture. I received both a blue and a pink 16 oz. Vapur Bottle for my review. I gave John the blue and I kept the pink for myself. I like bringing mine with me shopping because I can roll it up and put it in my purse and its out of sight. I like my water cold so I use the tip they suggest about freezing half of it and then filling up the rest. It works awesome for keeping the temperature nice and cool- the perfect solution for thirst. John has brought his with him to work a few times and when he is done with his, he just rolls it up and puts it in his jacket pocket. Vapur bottles sell for $8.95 and come in the colours, blue, green, pink, smoke, and purple. They are currently only available in the US. I hope they come to Canada soon though. I think Canadians will really like this unique product. 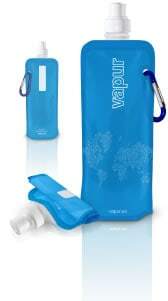 If you are looking for an eco-friendly alternative to bottled water that is perfect for a person on the go, then you need to check out Vapur. Their bottles are both functional and unique and I can honestly say I have never seen anything like them before. Good job Vapur! I follow via GFC . I follow Vapur on Twitter @RazzMyBerry. i learned that it’s dishwasher safe and that average American uses 1,190.5 gallons of water per day..that’s insane! I learned Vapur bottles save 90% of the space compared to their counterparts…that’s impressive! I learned that it’s better to Send e-vites or use social media. Instead of wasting paper with traditional invitations, invite your guests to a summer bash electronically! I learned that 50 billion bottles of water are consumed annually in the U.S. and around 200 billion bottles globally. Vapur bottles save 90% of the space compared to their counterparts. I learrned that the bottles have a “writable text area for personalization”. I entered Review Retreat’s Vapur Giveaway.